When we make tea or coffee, what we are really doing is making an extract which contains a number of different chemical substances which dissolve in different ways in different solvents. Fat and oil dissolve in petrol and paraffin, while sugar and salt dissolve in water. Certain solvents can dissolve both comparably fat (lipophilic) and water soluble (hydrophilic) substances. 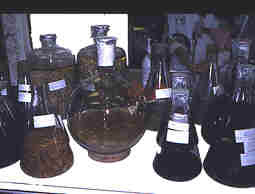 Extraction of marine organisms in flasks. If you pour petrol and water into a can, you get two phases – a water phase and a lipophilic organic phase (petrol), which do not mix. If a substance is dissolved in one of the phases, it will separate in a certain way between the water phase and the petrol phase. The separation depends on the polarity of the substance. If the substance is fat soluble, it will end up in the petrol phase and, in the same way, one that is water soluble will end up in the water phase. Certain substances are divided between the water phase and the organic phase. 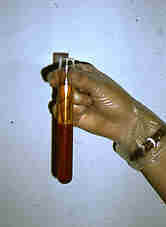 A test tube containing a red water phase and an orange organic phase. The substance dissolves more easily in the water phase than in the organic phase. Under really extreme circumstances, e.g., particular pressure or temperatures, you can extract using liquids that are normally gases. When the extract returns to normal conditions, the solvent becomes gaseous and you are left with a dry extract. Whether the substances in a solution dissolve or not, depends partly on the amount of solvent used. The solubility is also affected by the temperature. It is, for instance, easier to dissolve sugar in hot water than in cold. When solubility decreases, the substance begins to precipitate or “fall out” in the form of solid particles. This can be achieved by reducing the amount of solvent, i.e., concentrating the extract, or by reducing the temperature, e.g., a hot sugar solution cools down and sugar forms. The precipitation can be either in an unorganised or in an organised form such as crystals. Depending on the concentrations of the substances in the extract and their chemical properties, the precipitation will either be a mixture or a pure substance, i.e., only a certain substance will precipitate. A more advanced way of separating substances is chromatography. The name comes from the Greek word chromo that means colour. The first substances that were separated were coloured and so you could see with your naked eye that the colours had separated. A fun experiment is to separate the colours of a felt pen. There is a stationary phase and a mobile phase. You simply need a disc or a tube – a column – for the stationary phase, which the mobile phase can run through or over. Different substances bind in different ways in the stationary or mobile phase and therefore move at different speeds through the column. The substances that bind best to the mobile phase run through the column fastest while the others that bind to the stationary phase are delayed. Thus various substances come out of the column at different rates depending on the choice of mobile phase or stationary phase. The effect of the stationary phase determines which type of chromatography is involved. separates the substances according to differences in their sizes. Big molecules come out first since they pass between particles while small molecules “get lost” inside the particles and therefore become delayed. A column – a glass tube with a layer of powder through which liquid is filtered. Different substances move at different speeds through the column which results in bands of colour. separates substances according to whether they contain positively or negatively charged molecules. When you use an ion exchange there are only two positions, either the substance fastens or it does not. If it fastens, you can loosen it by rinsing with acid or alkaline solutions, i.e., charged solutions. Different substances have different attractions to the stationary and the liquid phase, which makes fat and water soluble substances move at different rates. In normal phase chromatography, fat soluble substances move faster than water soluble ones, whereas in reverse phase the water soluble substances move fastest. As in ion exchange, substances are separated according to their charges. But in this method, chemical tension is used in the stationary phase and the strength of the electrical charge of the substance determines how fast the substances move. Research about these techniques and their uses is carried out at the Department of medicinal chemistry within the Faculty of Pharmacy, Uppsala University.